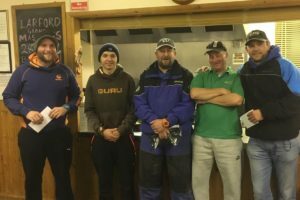 32 anglers fished in today’s Larford Grand Masters. Temperatures have risen a bit to highs of 8C, overcast and a light breeze. 1st on the day was Bernard Ball (Carp Cruncher) who drew peg 2 on the Arena Lake. Bernard caught on bomb & pellet and bomb and waffle to weigh 93-08-00. 2nd on the day was Ray Lamb (Larford) who drew peg 66 on the Specimen Lake. 3rd placed Neil Colcombe (Larford) who drew peg 74 on the Specimen Lake weighing 61-04-00 to method & long pole. 4th on the day was Matt Blackmore (Garbolino/Dynamite Baits) who weighed 53-13-00 from peg 46 on the Match Lake. Matt caught on Method and long pole & pellet. 5th placed Sam Brown (Maver) drew peg 72 on the Specimen Lake weighing 50-01-00. Sam caught on the Method & long pole weighing in carp & bream. 6th on the day was Warren Jennings who drew peg 1 on the Arena Lake weighing 45-09-00. Bernard Ball, Ray Lamb, Neil Colcombe, Matt Blackmore & Warren Jennings all qualify for the Grand Master final. Bernard Ball also qualifies for the Larford Classic final too.